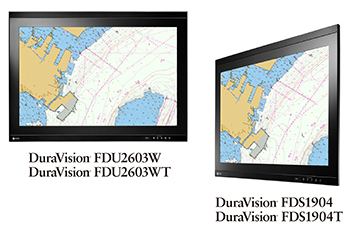 Hakusan, Japan, August 20, 2014 – EIZO Corporation (TSE: 6737) announced the expansion of its current line of maritime monitors to include the DuraVision FDS1904 and FDS1904T (19-inch) and the DuraVision FDU2603W and FDU2603WT (26-inch). The new lineup now provides a wider selection of monitors with high visibility and reliability for displaying ECDIS / RADAR applications. The touch panel variations, DuraVision FDS1904T and FDU2603WT, accept touch input from a bare hand or stylus and support multi-touch operation. They also feature a high resistance to dust and water droplets to minimize unintended input compared with other touch technologies. All monitors meet the requirements for numerous classification societies for operation in ships and offshore structures including GL (Germany), BV (France), LR (UK), DNV (Norway), ABS (USA), ClassNK (Japan), KR (Korea), and CCS (China). They meet the conditions for temperature, humidity, and vibration as defined in the IEC 60945 international standard for maritime navigation and radio communication and the IP65 rating ensures they are protected against ingress and low-pressure water jets. The brilliance (brightness), gamma, and RGB color settings of each DuraVision marine monitor are calibrated at the factory for accurate color reproduction, meeting the IEC 61174, IEC 62288, and IEC 62388 international standards for ECDIS and RADAR applications. The new 19-inch and 26-inch monitors are equipped with an ECDIS indicator that shows when the monitor’s brilliance is correctly meeting the standards for ECDIS. They also have a marine alarm buzzer conveniently installed directly in the monitor. The long-lasting LED backlight equipped in each monitor provides increased reliability, consumes less power, and is mercury-free for minimal impact on the environment. EIZO’s line of marine monitors are developed, manufactured, and tested in-house to ensure the reliability and high performance essential for harsh marine environments. Each monitor also comes with the option of adding in-house optical bonding for increased visibility and durability. EIZO’s optical bonding increases light transmission and significantly reduces screen reflections for exceptional visibility even when viewing the monitor in direct sunlight. Optical bonding also prevents condensation that causes screens to become foggy; a common occurrence in environments with extreme temperature fluctuations. A screen with optical bonding is more resistant to applied pressure, giving it increased physical durability. The DuraVision FDS1904, FDS1904T, FDU2603W, and FDU2603WT will be shipping from the end of September, 2014. Please contact the EIZO subsidiary or distributor in your country for details.